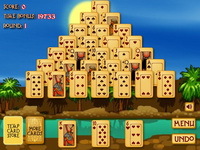 Description: Classic Solitaire game, variant on Klondike. Move all cards to the 4 foundations. Groups of cards can be moved, the cards below the one to be moved do not need to be in any order, except that the starting and target cards must be built in sequence and in suit.